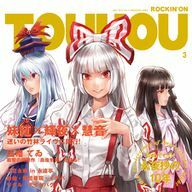 ROCKIN'ON TOUHOU VOL.3 is a doujin album by IOSYS released on 2014-05-11 (Reitaisai 11). It features vocal and instrumental arrangements of themes from Imperishable Night. This page was last edited on 13 April 2018, at 14:51.